Awarded by Amy Shipp at Our Fun Funky Life! Awarded by: Irene at Our little piece of the World. Awarded by: Maria at Mommy of Four, OhMommy at Classy Chaos and The Sports Mama at You Don't Have to Like Me. Awarded by: The Sports Mama at You Don't Have to Like Me. Awarded by:Irene at The Green Greek. 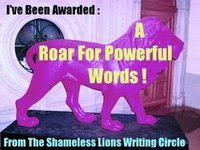 Awarded by: Rachel at "From the Land of Monkeys and Princesses". 12 Years of Dating, and this is what I get.